Dr. Eisenberg received his medical degree from the State University of New York which was followed by a two-year general surgery resident at New York Hospital - Cornell University School of Medicine. He then moved to Boston where at the Brigham Women’s and Children’s Hospital he was a neurosurgery resident. After two years in the Navy he completed a research fellowship at Harvard, and then was a junior faculty member there. 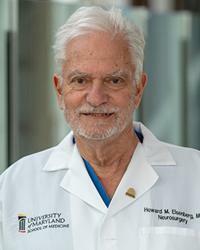 From there he moved to University of Texas where he became chief of neurosurgery. University of MD Neurosurgery Associates, P.A.